Vladimir I, also known as Vladimir the Great (Norse – Volodmyr) was one of the most influential Russian rulers in history. Born in 958, he was the son of Sviatoslav who died in 972. 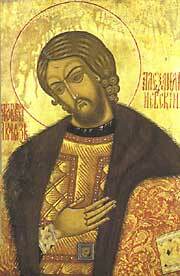 Vladimir’s brother Yaropolk assumed the throne violently by killing their other brother Oleg. Forced to flee to Novgorod, Vladimir hired a band of Varangian mercenaries to help him overthrow Yaropolk. In June of 980, Vladimir seized the capital in Kiev with the help of the boyar Blud who turned on Yaropolk who was eventually captured and killed. Once settled in his role as Grand Prince, he began to expand Kievan influence by attacking the Bulgars, pushing towards the Polish border in Galicia and northwest towards Lithuania. On his way, the Grand Prince attacked the land of Polotsk, whose Prince refused Vladimir’s request for his daughter Rogneda in marriage. Not one to be told no, the Kievan prince took the young woman anyway. This was not to be the only wife or concubine that the pagan Prince had. Some estimates believe he had over 800 women in his service. While the country had a smattering of Christians throughout the land due to his grandmother Olga’s influence, paganism was still the religion of the land. Vladimir promoted the Perun, who was the god of thunder as the lead diety. Human sacrifice was the norm until the Grand Prince began to see a growing population of Christians. He saw a political opening to expand his power base but he had to act prudently and wisely. According to the Primary Chronicle, he sent emissaries to the centers of a number of religions to bring back information about each. The reports on the Jewish, Catholic, Muslim and Orthodox religions were brought back. At the time, Constantinople was the seat of the Orthodox religion as well as being the capital of the most powerful civilization in the world, Byzantium. It is said that Vladimir chose Orthodoxy because of divine inspiration but it is likely because of political benefits of being allied with such a great power. He decided to press the issue by attacking the Byzantine city of Chersonesos and demanded the hand of the Emperor Basil II’s sister, Anna. This was an impossible request as the Grand Prince was still a pagan. To make the deal, Vladimir was baptized in Cherson, taking the name Christian name Basil and Anna was sent to be his wife. On his return to Kiev, the Grand Prince ordered all pagan statues destroyed and the people mass converted to Orthodox Christianity under threat of death. 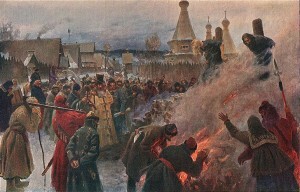 His conversion of the people was one of the most important events in Russian history. Vladimir’s rule marks the end of the Varangian era and the beginning of the Christian era which was to last until 1917. Tsar Alexander I, also known as Alexander the Blessed was born on December 23, 1777. His rule of Russia from March 24, 1801 following the assassination of his father Paul I, was a tumultuous one. The crowning glory of his reign of course was the defeat of Napoleon Bonaparte during the Napoleonic Wars. Born to Paul Petrovich Romanov and Maria Feodorovna née Sophie Dorothea, he was raised primarily by his grandmother, Catherine the Great. She had little faith in his father Paul which caused Alexander a great deal of difficulty later in his life. 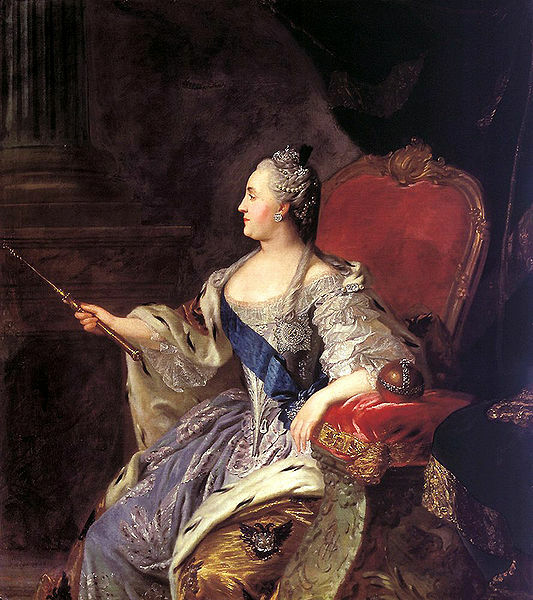 He tried to appease both his grandmother and his father which led to his doing the same when he became Tsar in 1801. Throughout his reign, Alexander tried to make everyone happy but he was also a master manipulator as well. After the murder of his father Paul in March of 1801, Alexander assumed the mantle of the Russian Empire with a great deal of guilt. Some say he knew that the conspirators led by Counts Peter Ludwig von der Pahlen and Nikita Petrovich Panin were planning the murder, others thought not. It is clear that he knew of the plot to remove his unpopular father from the throne. It is equally clear that they did not tell him of their nefarious plans. Nonetheless, Alexander did take over (Episode 53) for his father at the age of 23 with the admonition “Time to grow up! Go and rule!” by General Nicholas Zubov. Early on in his reign, Alexander began to try to reform the country especially the government. Led by the liberal Mikhail Speransky reforms were drawn up and ready for action. Some of the reforms came to be, but for the whole, not a lot was done partly due to a problem that was cropping up in Europe; the arrival of Napoleon Bonaparte to the world stage. It was his battles with Napoleon (Episode 54) that made Alexander I the hero that he became to his people. Starting in 1807 and finishing in 1814, the war against Napoleon had its ups and downs but eventually, Alexander and his Russian army prevailed. After this though, the Tsar’s personality took a conservative and somewhat mystic turn. In 1825, in the town of Taganrog Alexander supposedly died after a short illness. Rumor though has it that he did not die that he became the monk Feodor Kuzmich. Some in the Romanov family were told that the two men were one and the same and there is actually a book called Imperial Legend: The Mysterious Disappearance of Tsar Alexander I by Troubetzkoy that claims the same thing. Whatever the truth, his brother Nicholas I takes over for him and begins the slide that the Romanov’s never recovered from. Prince Mikhail of Tver, the second son of Grand Prince Yaroslav III of Kiev was born on November 22, 1318. Mikhail Yaroslavich was the Prince of both Tver and had two rules over the principality of Vladimir (1304-14 and 1315-18). He was made a saint of the Russian Orthodox Church. Prince Mikhail had alienated the Russian Orthodox Church during his reign. Metropolitan Petr came to power despite Mikhail’s nomination of another person. The hostility between the church and Mikhail carried on for the rest of his life which makes his elevation to sainthood quite curious. The time of his rule was the period in which Russia was ruled by the Golden Horde of the Mongols who were based in Sarai. It was also a time where Tver battled Moscow as a dominant city in the eyes of the Khan. 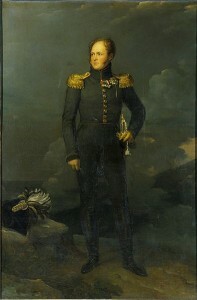 Prince Yuri of Moscow (Episode 5) was his main rival. At the time the rivalry was fought out not just on the battle field but at the court of the khan of the Golden Horde. At first, Mikhail had a good relationship with Tokhta khan and his successor Uzbeg but Yuri was able to circumvent this by marrying Uzbeg’s sister. Uzbeg then decided that he would take back Tver and Vladimir from Mikhail by sending troops to aide Yuri in his fight. Mikhail was able to defeat the combined forces and captured Yuri’s wife and Uzbeg’s sister. Unfortunately for Mikhail, his hostage died while in his custody. This obviously infuriated the khan. He sent recalled his general Kavgadii to Sarai who accused Mikhail of murdering the khan’s sister and warring against the Horde. This was to be Mikhail death sentence. Mikhail had no choice but to go to Sarai to face the charges but his plea that he was not guilty and that his hostages death was accidental was of little help. He was summarily executed. Archpriest Avvakum, was one of the most influential of the Old Believers movement which was started in opposition to the reforms of Patriarch Nikon between the years 1652-66. Avvakum believed that the changes were abominations in the eyes of God and would not agree to them. The following of the old ways continues to present day where there is an estimated 2 million followers in Russia. The schism, known as the raskol (which means cleaving apart) caused great consternation within the Church and Russia. The reforms were caused by findings that the Russian Orthodox rituals and writings had deviated from the Greek Church over the centuries. It was thought that the changes were due to poor transcription and translation from the original Greek. Patriarch Nikon had full support from Tsar Alexis I (Episode 25) who called a synod (meeting of the church hierarchy). It was agreed that major deviations occurred which led to an over 400 page report making the changes law of the church. Many church goers refused to follow the changes. Many fled Russia and headed to the north and east. Those that remained were harassed and persecuted. 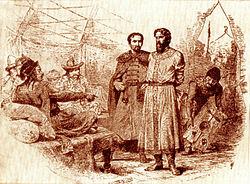 The leaders were arrested and sent to exile in Siberia. Avvakum was imprisoned countless times for the rest of his life after first opposing the changes. He began to write an autobiography which has been reprinted and translated numerous times over the centuries. His final 14 years were spent in a sunken, log-framed hit in the ground in the town of Pustozyorsk which was above the Arctic Circle before he burned at the stake. Over the years, the Old Believers were persecuted. Peter the Great double taxed them for refusing to shave their beards. Nicholas I viewed them as a threat to his rule and harassed them mercilessly.